Anne Frank Meets God has completed production! Now we need you to help us promote this powerful film. We are honored to tell this moving story, and thrilled to present to you an opportunity to join us! Click below to be a part of this journey with us. 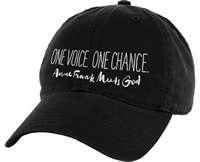 For your gift of $50 we will send you this baseball cap with special AFMG logo designed to show your awesome support! 100% cotton, adjustable, (as seen in photo). PLUS "Thank You" credit on the website! One Ticket to Private AFMG Los Angeles Premier Party and Screening (Q&A with director) OR receive behind-the-scenes footage with private link. PLUS "Thank You" credit on the website.